In-uterine video technology is growing by leaps and bounds. We can now watch detailed, clear video of the developing unborn child. The quality of this video blows away even 4D ultrasound. Although not a "pro-life" video and has nothing to do with abortion, National Geographic has produced an awesome DVD, with that sort of high quality videography. 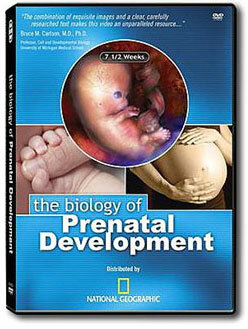 It is called The Biology of Prenatal Development and is also available for purchase at our online store. If you are an educator, this 42 minute video is perfect for showing in a classroom setting. It contains nothing controversial. It simply provides biological facts and is appropriate even for public, secular schools.